Fill The Boot is back in Cottage Grove! It's that time of year when South Lane County Fire & Rescue and the Muscular Dystrophy Assosiation team up with you; our local area residents, to help combat the harmful effects of muscular dystrophy. You'll see us out at the intersection of Hwy 99 and Main St. in Cottage Grove on Friday, July 28th with boots from 11:00 to 5:00 PM collecting donations for the cause. Any assistance is greatly appreciated!  Use of illegal fireworks is prohibited at all times, and in any location within the District. 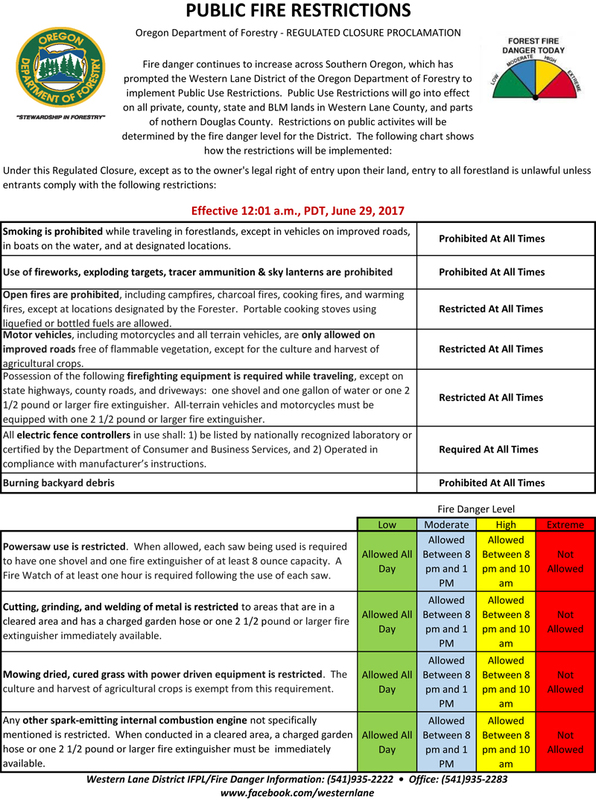 Legal firework use is permitted in areas free of dried, cured grasses, brush, or trees unless prohibited in areas jointly protected by SLCFR and the Oregon Department of Forestry (ODF). Generally and where permitted firework use is only permitted on asphalt, concrete, or gravel and a charged garden hose or one 2 ½ pound or larger fire extinguisher is immediately available. Moderate= Blue: Activity permitted until 1:00 p.m. and after 8:00 p.m.
High= Yellow: Activity permitted until 10:00 a.m. and after 8:00 p.m.
South Lane County Fire and Rescue will be holding a Work Session on Thursday June 15, 2017 at 6:30pm. There will be a Budget Hearing at 7:00pm with a Board meeting following directly after. This meeting will be held at the Cottage Grove Fire Station located at 233 E. Harrison Ave Cottage Grove OR 97424.